It took me almost four long years to package the memories of my past in the form of a book. I had written about this book in the Sun Blogs sometime back. But I never thought, in any stretch of my imagination that I would be in a position to publish this book so early. And the sleepless night that I had on 22nd April 2007 was in fact the culmination of my struggle in putting the memories of my past on paper. It was tough. I am not a professional writer and I had my own difficulties in completing this book, for there were times when I thought I ran short of words in my vocabulary to get on with this work. On the other hand, It was also my dream to pass this on to so many people close to my heart at the earliest possible time, because I wanted to tell them, through this book, how much they all meant to me. And on 22nd April this year, when I got so close to complete this work, I felt very restless to somehow finish this of. And when my colleague Sindhu offered me to help me in getting this printed in a record four hours time, I knew I was very close to fulfiling my dream of passing this over to my parents on the date of my birth; that’s today. It was an emotional and memorable moment for me. I don’t think there is anything in this book for the public. Hence this is meant for private circulation only. Of course, it’s not perfect; there could be mistakes in it, which I will correct in course of time. I must not fail to mention here the fact that there were a whole lot of people including my relatives, friends and colleagues, who encouraged me in this whole process and helped me directly or indirectly to make this happen. I take this moment to thank them all for their valuable suggestions, support, advice and encouragement. It’s one of the wonderful birthdays that I have ever had. I thought of taking some rest during this weekend, but didn’t happen. No regrets though. Tonight, I am doing something that I have been trying to do over the last couple of years. I wouldn’t want to detail anything about that now. Time is not suitable for that. And I wouldn’t sleep until I complete my job. Perhaps I may not get any sleep tonight. But that’s okay as I have no class the coming week. I will talk about what I am doing now later, may be another few days later. This may turn out to be a remarkable day in my life, when I would achieve a milestone in my personal life, subject to the completion of what I am doing now. Hence I pictured this moment myself. The week passed by I completed a workshop on JES and a course on Sun Java System Directory Server 5.x: Maintanance and Operations. It was a difficult week for me as I was just recovering from Laryngitis. But I believe I managed to ensure that the bunch of people in the picture below, who flew from various parts of this country for this training program carried back with them a fair amount of knowledge on the JES and Sun Java System Directory Server 5.2. All thanks to them for their understanding and more so for their cooperation and active participation. Just over an hour ago, the last ‘Super Eight Stage’ game of the ninth edition of the cricket world cup kicked off at Bridgetown. With all the semifinalists of the tournament already decided, this match is inconsequential. Still, this game would be watched by millions of viewers across the world for one main reason that after today, one of the Cricket’s extraordinary batsmen would never take the cricket field again. Brian Charles Lara, one of my favourite cricketers would play International Cricket one last time. After the retirement of Steve Waugh I had stopped watching Cricket to a greater extent. 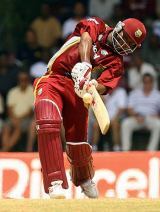 But Lara’s heroic moments always remained very dear to me and I have always enjoyed watching him play Cricket. Perhaps, I watched Cricket in the ‘Post-Steve Waugh’ era only to watch the entertaining Lara. Of course there used to be so many controversies surrounding this great cricketer and he is leaving the West Indies team in a shape that’s certainly not promising. But Brian Lara is one such cricketer whom the entire Cricket loving fans, including the Australian legend Steve Waugh, loved to watch, anytime, always. It is indeed sad that, today, we have reached the dead end of the fascinating journey with Lara rather abruptly. I have been involving myself in the process of helping lot of youngsters associated with me in adapting to a Unix flavour and I had chosen Ubuntu for them because of the very simple reason that it “just works.” And today I am more than excited to hear the news about Java being a part of Ubuntu 7.04 [Fiesta Fawn] and the users of Ubuntu 7.04 can just download and install Java from the repository. It’s great that the GNU/Linux Community now gets the power of Java. Java is not the lone component that Sun is putting in Ubuntu. There are so many development tools becoming a part of Ubuntu and you may read about it here and here. I was really worried, when I left my home after jotting down my previous web log entry. I was to disobey my doctor to speak to a small audience on Sun Java Enterprise System. I was literally stepping into the third day of a five day training program because this program was once cancelled after two days because of a personal tragedy. So any more hiccups to this training program was beyond an acceptable limit. Fortunately, my audience was kind enough to raise themselves to understand my situation and listened carefully to my very low and soft voice. Not only that, a couple of them readily accepted my request to review some of the topics that I discussed in the class, speaking about it louder to the entire class and throwing more clarity to eveyone out there. Below you would see the pictures of Saurabh and Sajin taking over the platform and reiterating through some of the topics in the JES Workshop. Thank you so much guys for your understanding. You must know that you all made me feel really better. Needless to say, I am in a much better frame of mind. For the last three days I have been doing continuous steam inhalation and taking in the Novamox (Never take medicine without the advice of a doctor) capsules three times a day. My situation is slightly better now. My doctor had advised me absolute voice rest for a week, which unfortunately is not possible in my case. I am going to speak again today, but this time the audience seems to be smaller in number. The doctor had warned me about a possibility of my blood vessels rupturing in the event of putting too much of strain while speaking, which would then take a longer time to heal. I can only hope that such a situation does not occur. In the interest of my duty that I love the most, I am going to disobey my doctor. But I shall try my best to speak soft all through this week. Let’s see how it goes. Good week ahead to all you. It appears to me that I would very soon become a popular figure among the ENT specialists in this part of the world. I am under medication again, this time it is a different doctor, but the reason remains the same: I have gone voiceless. Thankfully, I survived my training this week that concluded last evening. I had received an E-mail from David Goldsmith the other day in response to my blog entry Deja Vu, kindly sharing with me his own bad experience during a training due to Laryngitis. He also mentioned to me the heroic story of an Instructor who suffered Laryngitis in the middle of a training and yet continued with his sessions, whispering the lectures to one of his students, who in turn communicated the same loudly in the class. The timely note from David full of wishes and encouraging words did a lot of good to the state of my mind. Thanks to him. My voice is cut off almost completely. Was shocked this morning to discover that my voice hardly came out. And I have a couple of more days of training to deliver. I had faced a similar situation a few months back about which I have written a note here. But on that occasion I had to survive only for a day. This time around I have another 16 hours of speech to make, with my voice hardly making its way out of my throat. I have no clue on how I am going manage the same. I should be able to give you an update about this towards the end of today. Hoping to survive this. Update @ 9:00 P.M. IST: Survived today. Felt giddy at times. Used board a lot. My participants were very co-operative and highly receptive. Thanks to them. Feeling slightly feverish. The nature of my job offers me direct acess to a good number of smart people in the Industry, from whom I have managed to pick up a few good lessons in life. And I have had the opportunity also, to talk to so many of them about the stability and features of Solaris OS and the immediate need to adapt to a Unix flavour to explore the actual computing power of a computer. Most of them, however, were reluctant to absorb this idea, indicating how dependant they were on the more familiar Windows Operating System, but a handful of others expressed their willingness to change their Operating Environment and try out something that would give them a better control and stability. Well, it is purely a personal decision to choose one’s working environment (read OS) as per the requirements, but at the same time it wouldn’t also be a bad idea to try out the various options that are available and then choose things wisely. I have found young people to be more open minded, may be because they are less egoistic. You pour ideas into them and they would start absorbing it and then would accept it if found interesting or would reject it mercilessly, but would certainly not close their ears to suggestions. So it is always good to begin a revolutionary process with them, the young ones. Afterall, they are the future torchbearers. Richie is my nephew and he is barely 15 years old. Like many others, he has been using a Windows version to play video files, to listen to music, to surf the Internet, to prepare his project reports and perform various other routine tasks on a computer. Recently I suggested him to try out something different. I did so mainly for the following reason: I didn’t want him to get into the loop of software piracy affairs and wanted him to know that there are several open source solutions available for students like him, which would not require shelling out too much of money for the OS and the other related softwares. My suggestion to him was to use Ubuntu. Why Ubuntu? Coz, it’s cool. Why not Solaris? Because he doesn’t require such a sophisticated Operating System. And thus I installed the Ubuntu 7.04 Beta on my machine to familiarise him with the GNOME interface. It looked awesome! For me, the Ubuntu desktop environment just appeared very similar to that of Mac OS X. Even Richie found the well organized GNOME desktop very interesting. Without much assistance he could navigate through the menu on the desktop and found out all that he wanted on his own. Below you would see Richie enjoying his Ubuntu experience. Richie is browsing the Sun website and has started to show interest in knowing more about the open source community. He has already had an argument at School about this newly installed OS (I wouldn’t encourage that of course) and is very keen to spread the information about a ‘non-windows’ OS to as many people as possible. Overall, he could get used to the Ubuntu environment just under an hours time!!! If a Fifteen year old could do this, why would an Eighteen old guy keep himself away from this change. My cousin Vivek stepped forward to start using this ‘new OS.’ And he was happy too with the great look and feel of Ubuntu. For Vinu, as we all call him, this OS offered him an interesting feature: minimal (no) use of CTRL + ALT + DEL key. He also hates to spend money for Anti Virus packages and I have guaranteed him that he wouldn’t require any of those softwares anymore. Know what, he is now trying to find out a mobile ringtone that matches the startup music of Ubuntu OS. Apart from keeping themselves away from the dirty software piracy affairs, these young chaps would also be able to add values to their life by being a part of a community program, where qualities like unselfishness, sharing and the likes are given very high priority. It is true that I don’t control their destiny. Afterall they are the makers of their destiny and they might even take a route that would not involve extensive usage of a computer. But for the time being I know for sure that these lads hold an upper hand, because they at least know, unlike several other who hesitate to open to suggestions, that Windows is not the only choice that they have. They have taken up the task of talking about this to their friends and acquaitances and I am sure several people of their age would come forward to try out this change. It would then be a pleasure to watch all of them play around with different flavours of Unix. Let me also add here that I have also provided them with a copy of Solaris 10 Developer Edition. Who knows, they might use it pretty soon! I know there are a few out there, who wouldn’t readily accept what is written on this note. I would rather encourage them to express their comments on all that I have written about. But before doing so, please ensure that your answers to the following questions are ‘yes.’ Only then would you be eligible to write a comment for this entry. (1) The Operating System that you use at your home is either a freely distributed version of an OS or a commercial OS for which you have paid, and not a pirated copy. (2) The softwares that you use at home including the office suite are either free softwares or commercial packages for which you have paid, and not a pirated copy. If you are associated with a few young guys in one way or the other, please do guide them to the wide range of options that they have in choosing their work environment (read OS) and believe me, they would thank you for the same. Catch ’em young. A long weekend is coming to an end and tomorrow the normal office activities would resume. I wouldn’t offer you a prize if you would guess about my journey homeward this weekend, for if you are one among those who have known me for a while or have occasionally hit the writings on this location in the past, then you would know how frequently do I journey home, especially if the weekends are longer than usual. Tomorrow, I have a class on Solaris 10 , and to ensure that the weariness of an overnight journey does not show up in me while facing the audience, I decided against my usual Sunday night bus ride from Kochi to Bangalore and hit Bangalore early this morning instead. That’s again one day earlier than usual. It is vacation time for all school going children and I have a few cousins who belong to that category. Needless to mention, it was fun being with them while at home. While being with them, talking to them and taking them to the backyard of my house, the fond memories of my summer vacations surfaced out in my mind, convincing me, for the umpteenth time, that those were undoubtedly the most carefree days of one’s life. My father has managed to plant varieties of plants and trees in our premises and most of them have now grown big. I walked around my premises, into the backyard, escorted by my younger cousins, capturing photographs of some of those fruits that we used to have in plenty during our school days. And in those days, I could climb on a few of those trees, an adventure that is no longer there in my agenda for obvious reasons. If you have a few moments to spare, then let’s take a short walk in my premises. The fruit in picture is Rose Apple. I figured out the proper English term for this fruit only after spending a considerable amount of time searching the Internet. And in the process, I came across a web log, where the author has expressed similar sentiments through her writing. You may kindly read her blog here. It is really good to munch on one of these because it is really sweet. As mentioned earlier, I had no intention to revisit my school days to such an extent as to climb up the trees to gather the fruits. That decision, however, did not give me the luxury of having a clear view of the guavas located on the top branches of the guava trees in my premises. The lone member in the tree to the right of this text was the only one at a shorter height. There are different kinds of this fruit available and is supposedly very good for health. Moving a little bit more into the backyard, you would hit a number of Jackfruit trees. The word ‘jackfruit,’ I read, derives from the Portuguese jaca, which in turn is derived from the Malayalam word chakka. Jackfruit is commonly used in South and Southeast Asian cuisines. It can be eaten unripe (young) or ripe, and cooked or uncooked. The seeds can also be used in certain recipes. Chips made out of this is very popular in Kerala. Mangoes grow in plenty at our place and stands as one of the most preferred fruits by all of us, mainly because it is so plentiful that you could be standing on the ground and yet be able to reach up and grab a few of them at a stretch. Its popularity can also be attributed to its wide range of usage as food. Again, there are different types of them available within our premise and I must thank my father for nurturing them so carefully. I don’t know Premnath. But without the help of his blog I would have had to spent a lot of time identitifying the right English word for the fruit that you see on the picture alongside this text. I like the look of Bilimbi fruit, but it’s sour in taste. May be, you will see a clearer photograph of it here. We do have a small plantain garden in our premises and it’s a good place to spend some solitary sessions. The one plantain tree on the picture here bent itself at an angle good enough for me to get a decent view of the banana flower. I am regarded as a good walker. But today, this short stroll, taking you around in my premise has taxed a bit on me and I am feeling slightly tired. May be it’s because my mind traveled a long way into my past, bringing back the vivid pictures of the memories of my childhood days, when I seemed to have been a little bit more in tune with the Nature than what I am in the current phase of my life.